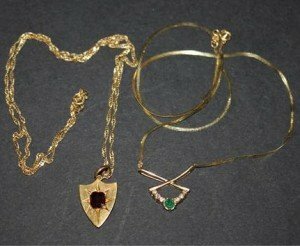 A gold, emerald and diamond set pendant necklace on a boltring clasp, detailed ’14k’, and a gold and garnet set shield shaped pendant with a 9ct gold neck chain. A 9ct gold amethyst and diamond oval cluster ring, a 9ct gold heart shaped blue topaz and diamond cluster ring, and a 9ct gold three stone garnet ring. 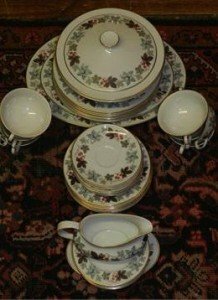 A 9ct white gold pavé set diamond band ring, a 9ct gold channel set diamond two row crossover ring, and a 9ct gold diamond set half eternity ring. 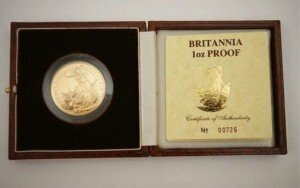 United Kingdom 1987 Britannia gold proof coin, in original presentation case, gold weight 1 oz. 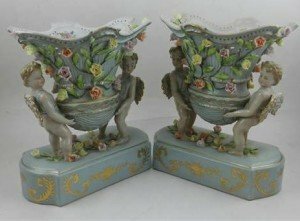 A pair of Continental porcelain comports, with encrusted floral decoration, the bowl supported by cherubs, raised on plinth having scrolling gilt foliage, bears crossed L to base. 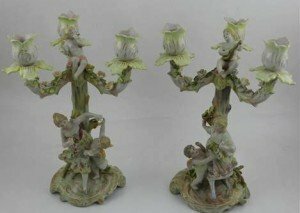 A pair of a German three branch porcelain candelabra, encrusted with flowers, having cherub playing the mandolin to top, the base with dancing female and cherub. 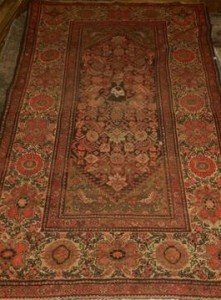 An early 20th century Zanjan rug, the centre having medallion with stepped pointed ends, within floral borders, fringed. 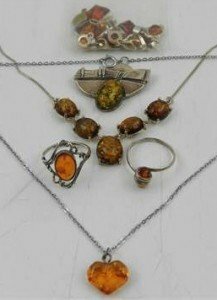 A quantity of silver and amber jewellery, to include a collection of small silver and amber pendants, two rings, two necklaces, and a created green copal pendant. 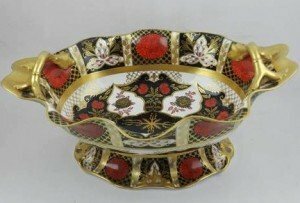 A Chrysanthemum pattern porcelain twin-handled comport dish, having floral and gilt decoration, with wavy rim. 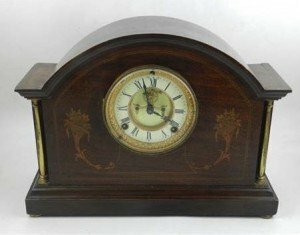 An Edwardian mahogany mantle clock, the ceramic dial with Roman numerals and Brocot escapement flanked by brass columns, with eight day movement. 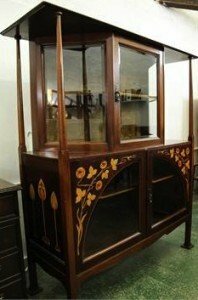 A Liberty & Co. mahogany Art Nouveau cabinet, the two cupboards inlaid with boxwood floral decoration, the side panels with stylised flowers, with glass cupboards above flanked by pillars, brass Art Nouveau handles, raised on square spreading feet. 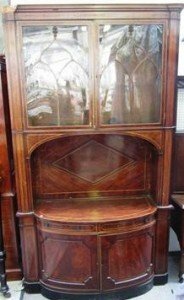 An unusual 19th century inlaid mahogany clerks cabinet, the pair of astragal glazed doors over an arched recess with cupboards, the bow base with lift top and pair of panel cupboards on plinth base. 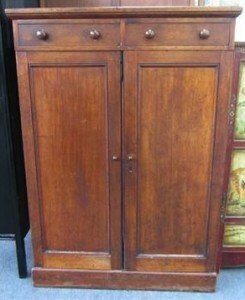 A 19th century mahogany linen press with single drawer over pair of cupboards enclosing three trays on plinth base, the drawer stamped R & J Newton London, 96cm wide. 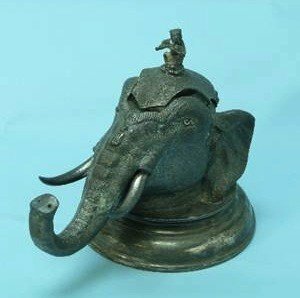 A late Victorian electroplate Brittania metal Inkstand, by Mappin & Webb, in the form of an Indian elephant head, the hinged lid with seated monkey finial enclosing a ceramic inkpot, on circular base. 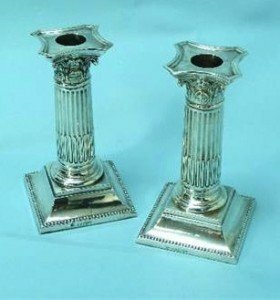 A pair of Victorian silver Candlesticks, by Martin Hall & Co, hallmarked London, 1892, the fluted columns with Corinthian capitols and removable drip drip pans, the square bases with beaded borders. 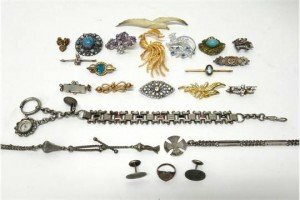 Mostly silver jewellery, comprising; an oval hinged bangle, on a snap clasp, a charm bracelet, a frog brooch, a brooch designed as the standing figure of a lady, a pair of earrings, a circular dress clip and a sliding bib hook, with a neckchain. 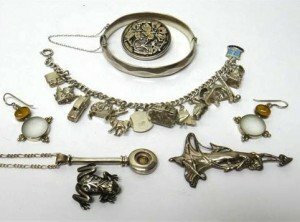 A group of jewellery, comprising; sixteen brooches, a dress Albertine with a pendant tassel, a pair of Sterling silver cufflinks, a heart shaped ring, a dress fob chain, fitted with a compass, a Faith, Hope and Charity charm and a cruciform pendant with a neckchain. 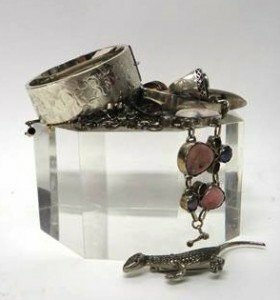 A silver oval hinged bangle with engraved decoration, on a snap clasp and silver and other jewellery, comprising; two gem set bracelets, two further bracelets, four brooches, three rings, a pair of gem set earrings, a pair of cufflinks, a dress albertine with a tassel drop and a curb link watch chain. 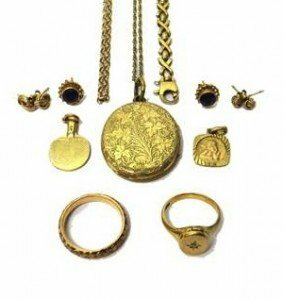 A Victorian gold back and front oval pendant locket, with engraved decoration, with a multiple link neckchain, on a boltring clasp, a gold ring, the oval hinged locket compartment to the front star set with a cushion shaped diamond, a 9ct gold decorated wedding ring, three pairs of earstuds, with post and butterfly clip fittings, a 9ct gold multiple link bracelet, with a sprung hook shaped clasp, a 9ct gold oval link neckchain, on a sprung hook shaped clasp and two gold pendants.